From time to time we offer extended trips of 10 and 12 hours. Depending on what fish are in season we may target Gag grouper, Red Snapper, hogfish or Shark. We can also do overnight trips. Give us a call at: 352-597-3900 if you are interested in any of these special trips for more information. 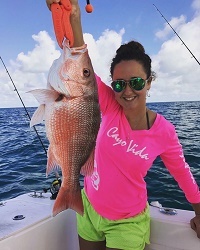 Our private charters are customizable to your interests and type of fishing desired. We are also available for sea burials. Let me know if your availability can be a couple days notice and if weekdays or weekends are best. Trademark and Copyright © THUNDER Party Boat. All Rights Reserved. Website Design and Hosting by Blarney Stone Marketing & Design.